“All women together ought to let flowers fall upon the tomb of Aphra Behn which is, most scandalously but rather appropriately, in Westminster Abbey, for it was she who earned them the right to speak their minds.” So wrote Virginia Woolf in A Room of One’s Own. Aphra Behn was one of the most influential dramatists of the late seventeenth century, poet and novelist. The fact that she is little known today makes her a perfect candidate in our celebration of the achievement of women. Her early years are unclear and even her place of birth and birthname are open to dispute. On account has her born in Wye in 1640 to John Amis, a barber, and his wife Amy. Another suggest she was born to a couple called Cooper. A third asserts that Aphra was the daughter of Mr. and Mrs. John Johnson of Canterbury, who became Lieutenant General of Surinam. Whether Aphra was his child or was fostered isn’t certain but it is possible that in 1663 Aphra went with Johnson, his wife, and a young boy, possibly a brother, to Surinam. It is said that Johnson himself died on the voyage, but the mother and children lived for several months in Surinam. A year later, in 1664, Aphra married Johan Behn, but the marriage is not thought to have lasted very long. She is known to have acted as a British spy, acting on behalf of Charles II, in Antwerp in 1666, using the codename Astrea. On her return to England, and apparently in debt for which she endured a period of imprisonment, she began to write for the King’s Company and the Duke’s Company players, working as a scribe in order to earn an income. She wrote a series of successful plays, her most successful, ‘The Rover’ (1681), had Nell Gwyn, mistress of Charles II, in its cast. Aphra also has a good claim to having invented both pantomime; ‘The Emperor of the Moon’ (1687), being the forerunner of the modern-day pantomime, and the novel; Ooronoko (1668) which preceded Robinson Crusoe by some 50 years. It is a story that is taken to promote modern, progressive views on gender, race and class. In all she wrote 19 plays and contributed to even to more and was one of the most prolific, high-profile dramatists in Britain. She also wrote poetry and translated works from French and Latin. She was most famous in her time for her bawdy works, which may be why her reputation waned in later years, particularly at the hands of Victorian litarary critics. She was also extremely ambitious, being clear that she wrote in order to gain money and fame, an attitude not felt to be approriate for a women of her time! Her lasting fame is hindered by the fact that almost nothing is known of her first 27 years and that for much of her life she was a pen for hire rather than someone suffering for her art. 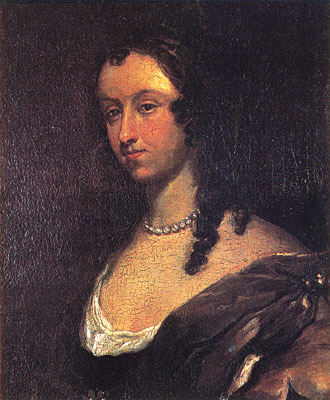 When Aphra Behn died in April 1689, her literary reputation was considerable, despite the fact that she was politically out of favour with the new monarchs, William and Mary. She was buried in Westminster Abbey. Interest in her work grew throughout 20th Century. Vita Sackville-West and Virginia Woolf were the leading exponents in a revival of the Restoration writer and were particularly interested in her status as the first professional woman writer. The theatre script launch of “Aphra”, celebrating her life and works, is taking place at Glasgow Women’s Library on 7th July. Nancy Jo Cullen, Rose Scollard and Alexandria Patience, who had fought to make their own theatrical visions through building the women centred, Maenad Theatre, learnt of Aphra Behn and understood it was time to re-claim her from the past. The script APHRA was written through this collaboration.